MilesWeb Vs GoDaddy : Which is the best hosting provider in India? Let me clear this right away, I’ve tried my hands at quite a number of hosting providers before finalizing this post, so yeah this one is going to be a review, a comparison between two of the leading giants in the industry. I’ll just list out what both the companies are offering you, and then you can decide for yourselves as to which one is going to be your new best friend. The Starter Plans:- The starter plans are the lowest plans both at Godaddy and MilesWeb. Now, the starter plan at Godaddy starts from INR 199/month! While the starter plan from MilesWeb costs just INR 1300/YEAR! Meaning, you don’t have to pay monthly for it. And you get the hosting plan at half the price! The Deluxe plan from Godaddy offers you Unlimited Space! The lower plans don’t! The Deluxe plan costs you INR 599/month. So in short if you need to avail unlimited space from Godaddy, you’ve got to pay INR 7188 per year. While the unlimited space plan on MilesWeb starts from around Rs 455/Month! That’s like 25% less compared to Godaddy’s unlimited space plan! Bandwidth is what keeps your server from crashing and both the companies know this all too well. That’s the reason both the companies have included the free bandwidth thing on all their plans! Means whatever kind of plan you’re on, you’d be getting the unlimited bandwidth from them! So yeah no matter how much traffic you’re getting, your servers aren’t gonna crash! When a web hosting company says it will return your money anytime when you want it back, that’s when I know that the company can be trusted! And that’s when I put all my trust in the company. Now, MilesWeb does offer you anytime money back guarantee! So at any point in life when you aren’t satisfied with the servers, well you can just ask for a refund plain and simple. But sadly, I couldn’t find any such thing on Godaddy! I might be mistaken, but on the homepage or product page or any other page, there was no indication that they had such a kind of thing running! I wonder why, but for now I’d say I’d like to be on the safer-side and hence I’m going with MilesWeb. Both the companies let you use cPanel for your server hosting needs. 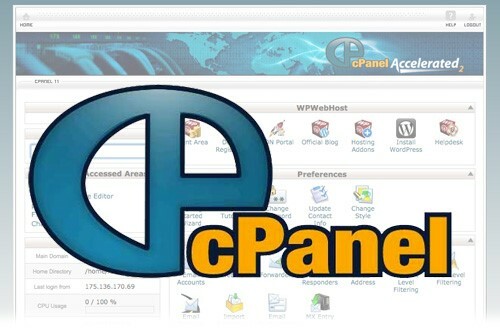 Meaning no doubt cPanel is the best file-manager when it comes to websites. And that’s what both the companies offer you. It’s their default system, meaning you won’t have to pay anything extra to use Cpanel to manage your Files and databases and anything else. WordPress powers more than 25% of the world’s websites! That’s like a huge number! So you need to install WordPress before you can use it to power your website, right? So that’s what Softaculous lets you do. It’s the “CMS hub” you can say. It lets you install over 300+ different scripts and not just WordPress with just one click. So yeah it’s of utmost importance. And that’s what both the companies offer you for free again! You can install WordPress with just one click! The MilesWeb servers are located in the prime locations around the planet like India, US, UK and even Romania. Godaddy servers too have a firm grip over the planet not to mention that. But still they are kind of “over-priced” for almost the same server locations (which doesn’t make a BIG difference). Yeah there’s always a chance when you can mess things up. Doesn’t matter what level of a person you are, but there’s a total chance that you might be in need of support from the team! This is something where both Godaddy and Milesweb are neck to neck competitors. Godaddy is an award-winning consumer support company while Milesweb too offers you 24×7 assistance over Phone, Email and Live Chat! And then finally down to the last section which seems to be the most important thing! The Starter plans as I already said with Milesweb start for as low as INR 1300/year! While the lowest plan with Godaddy costs you around INR 199/month. That’s like double the price of MilesWeb! And additionally, You get FREE SSL certificates with MilesWeb ! Even with the starter plans! But you don’t get FREE SSL with Godaddy unless you buy the Ultimate PLAN that’s like INR 600/month! Yeah, extremely expensive I know! So yeah, I’d say if you take into account the Free SSL certificate, the Pricing, the SPACE and other metrics, I’d say MilesWeb is a pretty good option! And here’s something I can claim personally, Godaddy servers sucked when I was with them for around 8 months! I wouldn’t make such a claim without solid backings. So from my personal experience, I’d say MilesWeb is worth a try! I use MilesWeb hosting service for my personal site from couple of months. As I switch to milesweb after attempting failure with other company like Godaddy. MilesWeb is easy to use and they offer many discounts at cheap price. Servers handle high traffic and data spikes well which is more important for any website. I know I am in good hands. I will recommend MilesWeb to everyone. I use my hosting package at MilesWeb. A test account for my web design activities. Plus I host a Magento Website. I’m very enthusiastic about MilesWeb. They have a great knowledge base, an excellent support of Magento and Mediawiki and the helpdesk is simply fantastic!!! My support questions are always handled in no-time and more than satisfactory. In a word: one of the very best hosting provider I know. MilesWeb has attractive features which make them best hosting provider. They offer different pricing models and if you are looking for niche micro site. They will provide you best offers and good bandwidth. As they have their servers in USA, UK, INDIA and ROMANIA. Control panel is easy to use. If you are at initial stage then MilesWeb is best option. Finding a reliable host is a serious, difficult issue today, But, I’m choosing MilesWeb because of their quality services and affordable hosting packages. And the support is responsive and very friendly to solve all your issues. Recommended service! I have many examples which I can share my experiences with MilesWeb. I switch to MilesWeb after attempting failure with Godaddy hosting provider. They maintain the standard of web hosting services and features, but their support is also amazing. I have just logged a ticket and within 5 minutes the case was resolved. I just wanted to say thanks to MilesWeb team and continue the excellent work.